This video will show you the basics of Scratch. Then you'll get to program your very first project, a victory celebration. Who doesn't like to celebrate after scoring a goal, beating the clock or making a basket? To open Scratch, click the starter project link next to this video. Then enter the sign in information from your passport. To save the projects you make to your account click "remix". If you ever need to switch back to this video on CS First, click the CS First tab at the top of your browser. Scratch is a programming language. Programming languages are tools that computer scientists use to give computers instructions. Right now, you're looking at Scratch's Project Editor. 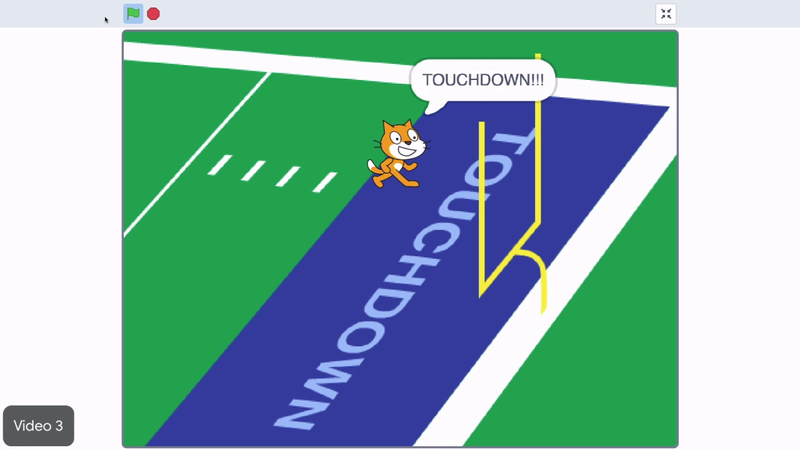 In the Project Editor there's a sprite on an American football field. A sprite is a character or object in Scratch. It moves around and acts on the stage. You will program sprites to do different things in your projects. The menus contain the instruction blocks you'll use to control the sprites. These blocks are sorted by color coded categories like motion and looks. The motion category contains blocks like move 10 steps, which moves the sprite a little bit in the direction it's facing. One of the best ways to learn computer science is to explore and try new things. While you're working in Scratch, if you see a block that looks interesting, click it to find out what it does. To select the block to use in your program, click and drag it into the scripts area. Many blocks have values that you can change by clicking on the white valued blank inside the block and typing. To add another instruction to your program, select another block and drag it until it snaps below the first instruction block. The computer will read the instructions you create to make your project do what you want. When a computer scientist tells a computer to read and carry out instructions it is called running the code. These blocks run in the order they are stacked. To run a stack of blocks, just click on it. Then it changes the way it looks. In Scratch, that's called changing costumes. This block looks like it goes around the other blocks so, this example we'll try that. Dragging out a weight block pauses the program for a short time then continues to the next block. Now it looks like the sprite is doing a victory dance and saying "Touchdown!" Now that you've seen a brief introduction it's your turn to explore. You will program your unique victory celebration for the Scratch cat. Remember to try out different blocks, click the stage icon, then the backdrops tab to choose one for your project. Once you have selected your backdrop, click on the cat, then the scripts tab. Use the blocks in the scripts menu particularly the motion and looks menu to program the victory celebration for the cat. Once you have a set of blocks you like adding a when flag clicked block from the events menu to the top will make the blocks run whenever someone clicks a flag. This will make it easier for other people to use your program. To share your project with the Scratch community click "share". Give the project a creative title, then add instructions so others know how to use your creation. In notes and credits you can thank your teammates or leaders. Click the Scratch link next to this video and sign in with the information from your passport. Program the Scratch cat's victory celebration. And finally, add a when flag clicked block to the top of your block stack.